Caucasus Youth Nexus and MASTERPEACE Georgia is pleased to announce a vacancy for the position of Project Assistant + Team member. 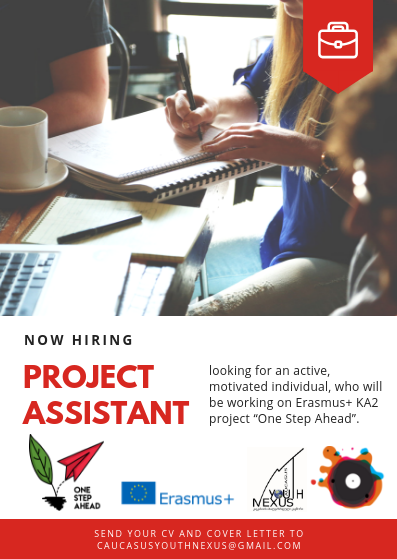 We are looking for an active, motivated individual, who will be involved in Erasmus+ KA2 project “One Step Ahead” and other organizational activities. “One Step Ahead” is a year-long project about social entrepreneurship, which is implemented with the support of the European Commission. The project coordinating organization is “Caucasus Youth Nexus” NGO (Georgia). Project partners are organizations “AsociatiaObsteasca INVENTO” (Moldova); “FUNDACJA AUTOKREACJA” (Poland); “Ung Kraft/Youth Power” (Sweden). One Step Ahead is a cross-national initiative designed to promote social entrepreneurship as a way for empowering youth at risk. Our aim is to increase professional capacities of participating NGOs by developing and giving them access to educational tools and methodological approaches allowing them to open up social enterprises that would contribute to sustainable development of their local communities. The aim of this proposal is to promote social entrepreneurship as a way for empowering young people with fewer opportunities and preventing them from permanent social exclusion and permanent unemployment. – BA Graduate or final-year student specializing in Social sciences, business or economy. – Assist Project Manager in organizing activities within the project. – Communicate with project partners. – Organize a research on social entrepreneurship challenges and solutions in Georgia. – Organize meetings in the regions of Georgia about social entrepreneurship. – Participate in all activities planned within the project. – Work on the idea of social enterprise. – Work towards the development of social entrepreneurship direction in the organization. -To Take responsibility to organize small activities, workshops, trainings regarding to Social Entrepreneurship. – To Take part in International and local projects. -To become head of Social entrepreneurship department. – To Take part in creating future perspectives for organization. Work schedule – Part-time, 20-25 hours a week.